This chapter sets out the context, framing, procedures and broad outcomes of a 3-year investigation of continuing education and training in Australia. The investigation sought to identify what might comprise approaches to and models of continuing education and training that might be applied across Australia, nationally, its regions and industry sectors. The aims of these approaches are to: (i) assist individuals sustain and develop further their workplace competence and secure advancement across lengthening working lives; (ii) address the needs of competent industry workforces, (iii) make workplaces safe and productive sites of employment and learning, and (iv) provide communities with the kinds of skills they require. In this way, these goals for continuing education and training are about supporting individuals’ employability and sustaining the social and economic viability of workplaces, industry sectors and communities. Specifically, the challenge for the investigation reported here was to identify a set of models through which continuing education and training provisions could be planned, implemented, supported and evaluated to achieve these goals. 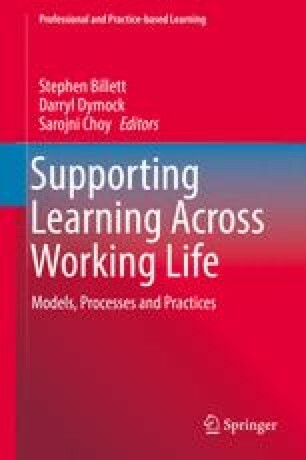 A key finding of the investigation was that most categories of workers interviewed preferred to continue to learn about their work learning through that work and as part of their work activities. These informants reported that much of this learning was secured by individuals through their everyday work activities, but often supported by other workers or experts present at the work site. In contrast, their managers and employers tended to prefer training programs to bring about particular changes and secure particular kinds of learning associated with workplace goals.